Experimente Mumbai, o coração pulsante e motor econômico da Índia. 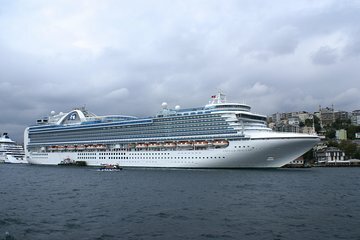 Desembarque seu navio de cruzeiro pela manhã e participe de uma excursão em um pequeno grupo para um dia inteiro de atividades. Explore as cores brilhantes e os cheiros fascinantes do Mercado de Crawford, assista à indústria de Dhobhi Ghat e Dabawallas e desfrute de um passeio de trem local. Maximize seu tempo e veja o melhor da costa de Mumbai. This tour by Muziris Heritage Day Tours was a pleasant surprise and Mumbai was much more pleasant than we expected. The tour bus picked up fourteen of us outside the passenger terminal where the ship berthed. We did not experience normal Mumbai because it was a Sunday, but this made it very easy in traffic and sightseeing. The small bus got around the streets easily and the excellent driver assisted us to cross the roads at times and moved the bus to meet us after getting off to see sights keeping it cool for us on a hot day. Our guide Sangeetha was so good that she could brighten up anything and anyone. What a beautiful and knowledgeable person. We saw everything on the itinerary except for the lunch delivering Dabawalla because it was Sunday and workers had the day off. The tour was comprehensive for the time we had in Mumbai. A lunch stop own cost with the option of dining in the Taj Mahal Hotel was wonderful and Sangeetha helped us to select local street food from the menu. The train ride was easy because the crowds didnt exist but it would be interesting on a regular workday.